This MS-O2 Molecular Sieve is specially suitable for PSA oxygen regenerating unit of large, middle or small scale to separate oxygen and nitrogen, producing rich oxygen etc. 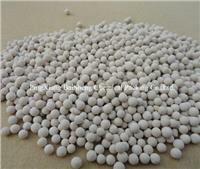 This MS-O2 Molecular Sieve has high oxygen production ratio and separation capacity for oxygen and nitrogen with excellent adsorption and desorption capacity, which make it specially suitable for PSA oxygen regenerating unit of large, middle or small scale to separate oxygen and nitrogen, produce rich oxygen for industrial and medical oxygen. * PSA oxygen regenerating, CO making unit and separation unit of n-alkanes & isoalkane. * PSA pressurized adsorption, Atmospheric pressure desorption of PSA oxygen regeneration. * VSP low pressure of PSA oxygen regeneration. * Heatless or low-thermal of PSA oxygen regeneration, gathering oxygen from air to be rich-oxygen and removing other toxic material.